Welcome to another installment of our Working in Theater series. This series in which we interview people working in different theater related jobs runs perodically on Saturdays. Today we will be speaking with the delightfully warm and infinitely inspirational, Jennifer Ashley Tepper (JAT). 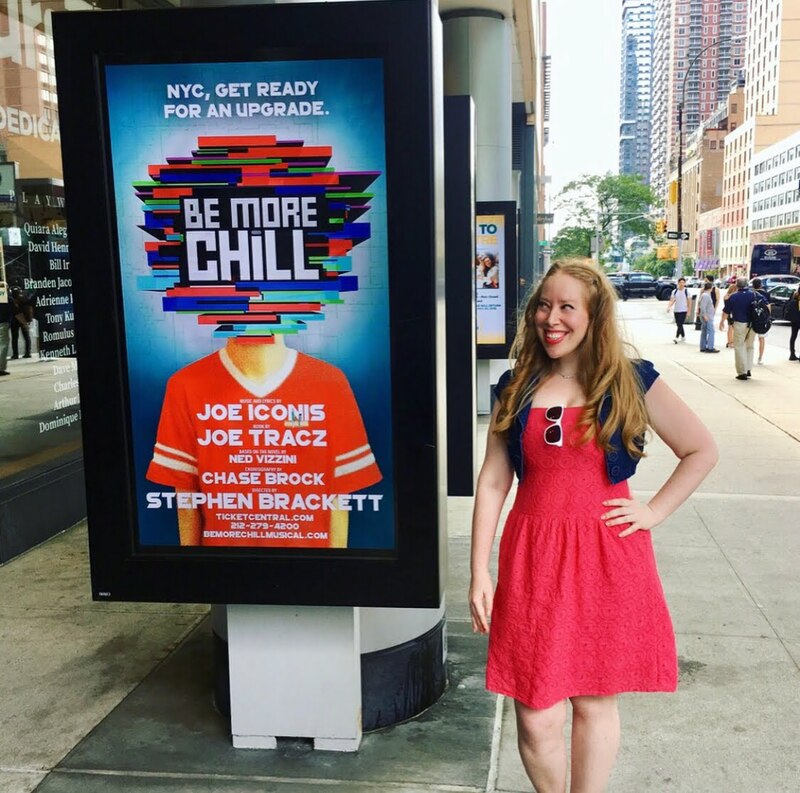 She is currently the creative and programming director at the dinner and entertainment venue, Feinstein's 54/Below as well as one of the producers of Be More Chill which will be coming to Broadway this February after an Off Broadway run at the Signature Theatre last summer. JAT: My job title at Feinsteins 54 Below is creative and programming director but I also work as a producer and a theater historian. What I do at the venue is a combination of getting shows to to the stage and then helping them reach fruition and have performances be amazing and as great as they can be. It's a lot of things. It's everything from figuring out what artists should play here to negotiating the contracts, figuring out how we should market them, coming up with ideas for what should happen during the shows, and managing all the logistics of running the venue with our tech staff and and our marketing staff and our front of house staff. So essentially, running this venue is like producing a ton of little shows. Then, a lot of what I do outside the venue is producing on a different level so it's interesting how they kind of feed each other. I have always been obssessed with theater history. and with producing, and I wanted to make musicals happen. I grew up in Florida. I went to NYU. I always knew I wanted to be in New York and after I graduated I was like "How do I work with history? How do I work in producing?" The way I eventually found myself here at 54 Below is actually that soon after I graduated I started working a lot with Joe Iconis, who is now like my closest friend and collaborator. I think that he is like the greatest musical theater writer that there is. We started working together. Ever since 2009, I have worked on all of his shows, and concerts in some capacity. The way I got my job at 54 Below was I produced his Christmas show every year. One year we were not able to do it at Ars Nova for the first time. We said we'll do it at that new venue that just opened called 54 below and that'll be great because we can't do it at Ars Nova.Then, a couple months after we did that, 54 Below was looking for a new programming director they said "We should get that woman who produced that crazy Joe Iconis Christmas show because that was insane, and she could run the venue if she can do that." Joe denies credit but he's really the reason that I have my job. What's funny is that my other full time theater job, that I had before this, was working for Ken Davenport, who's a Broadway producer of Godspell and lots of other shows, and the way I got that job was because I was working on Joe's musical Bloodsong of Love at ARS Nova. Ken wrote to me and said "I want to hire you to do the things that you are doing on Bloodsong of Love on my shows." Actually, it was interesting because I had applied for jobs with him before and never gotten them so the way I actually got my job was from working on Joe's shows with them. So a lot of my career is very intertwined with Joe. How long does it typical take to get a show open at 54 Below? JAT: The interesting thing about 54 Below is that we do so many different kinds of shows all the time. It's everything like musicals in concert, and Broadway stars doing solo concerts, and new writers and all this stuff. Essentially, a lot of the shows here are me going "Oh that person should do a show" and reaching out to them or their agent or their producer, and a lot are people coming to me and saying "I want to do a 54 Below show. How do I get started and what does that entail? " It's a combination. Ideally, every show would be on sale for 3 months to give people enough time to learn about it and plan to come to it and to plan the show itself. That's not always the case. I guess that's about the average amount of time that something is on sale, but we have things that are planned ten months in advance. I just booked something for next December. It's an interesting thing. Sometimes, it's like "Hey we want to do this in a month Let's make it happen." So it's kind of a range. Did you have to get any special training for your job? JAT: What's interesting is that, I feel like for most jobs in the theater your best training is actually making stuff and doing things. I went to NYU, but I always feel like my best training for what I do now was being in New York. New York was my campus, going to shows, taking notes on them. reading books that I assigned to myself, teaching myself things, producing my own shows on campus, all of that was just as valuable as the actual school part of it. Really, I think that for so many jobs in theater, for instance, you can't go to school to be an agent, and agent's are like some of the most powerful people on Broadway, Most of them majored in theater, and at that point, you really only have options like performing. There are some schools that have great programs for technical majors. There are so many jobs that you can do in theater that there is no truly no training for. What's interesting is that that you just kind of make up your own training as you're in the professional world. JAT: The best part of my job really is giving a platform to people that I believe deserve one. So much of the last five years at 54 Below, it's like "Oh that song was performed for the first time here or oh that person worked together with that person for the first time." You see these collaborations or these songs or these shows grow and change people's lives and they started here. Being able to say to a writer or an actor, " Hey we have 150 seats. Do you want to do a little show at our venue?" Then, they go on to do, there are so many examples but this season my friend, Bonnie Milligan, is killing it in Head Over Heels on Broadway and so many performances of her here I can remember thinking "Oh my god this girl is going to be a star!" Getting to give her a a platform here that way for the first time, and there are so many [other] actors and writers [too] I who feel so honored to have been part of their journey early on. What's the worst part of your job? JAT: It's not fun, but it's not really awful anymore that it really is 24-7. My parents and most of my family are in medicine and in medicine there are legitimate emergencies. There aren't really legitimate theater emergencies, but in order to run this venue, it really requires that you have to be available around the clock. That definitely has its drawbacks. You're always having to answer a million things and be alert and aware of everything going on here all the time. We are never closed. We have no day of the year when we're closed. That's a challenge, but it's definitely not the worst, but it's definitely one of the less fun parts of the job. JAT: This year has been so much about Be More Chill, but it's also been about The Jonathan Larson Project which I spent five years putting together and researching and coming up with what that was going to be. The fact that that and Be More Chill were happening at the same time was really special. Those mean a lot to me. One of the best things about Be More Chill is actually that I feel like this is the beginning of a lot of Joe's shows happening in New York and happening in bigger ways. I love so many of his shows equal to Be More Chill. it's very special that this is our first Broadway show together but there are so many more of his musicals that I feel are going to get to happen because of this, and they are all special to me in different ways. How did you get the idea for the Jonathan Larson project? When [City Center] Encores did Tick Tick Boom a couple years ago, I ended up doing a lobby concert that was like a miniature version of unheard Jonathan Larson works. It was just like five songs. It was in the lobby before the show. It was casual. At that point, I starred going "Oh I really want to do a full evening of unheard Jonathan Larsen work." I started talking to the family about getting permission to do it and researching it. The spark actually came from that concert at City Center, but I have just been so obssessed with Jonathan Larson's work for so many years that it was always in my head in some way. I love doing evenings of underappreciated material and cut songs and stuff like that. So it felt like a lot of things prepared me to do it over a number of years. How did you get involved with Be More Chill? JAT: I was obssessed with Joe's work. I had an internship when I was 19 where I listened to some demos at the York Theater, and I was like "What is this Joe Iconis stuff? These songs are crazy. They are so great!" When I was working on Title of Show, which I was the assistant director of the summer before I graduated college, one of our producers was producing Joe's Song Cycle Things to Ruin a couple of months later. I said to her "Oh My Good! I think that guy is like the most talented writer! Can I help you? Can I assistant you? Can I volunteer? Can I do anything?" So she hired me to be her assistant during that time. That's when I really started working with Joe and the family. I really bonded with them and never turned back. That was 2009, and from then, on I worked on everyting with him. Be More Chill came about because Scott Chaloff who is Joe and Joe Tracz's [the playwright who wrote the book of Be More Chill among other things] agent knew the book and said "Hey, you two should meet each other. You would like to collaborate, and you would also both really like this book. Check it out." Which they did. That was in 2011, so only two years later, I remember that they decided they loved it. They wanted to do it, and they wanted to get a theater to commission it so they knew that a production would happen if they wrote the show. It was Two River Theater [in Red Bank, New Jersey] and that took until 2013 to work out. So it wasn't until 2013 that they started really writing songs. I remember Joe sending me some of the songs when he was first writing them. I remember where I was when I got the e-mail saying "Hey! This is a song called 'Why I Love Play Rehearsal by Christina Canigula' because that was the title then. Joe, like he does with all his projects, would just talk to me about it so I wasn't working on it in any official capacity. Then, as it went on, I got to see all of the readings of it, and everytime he brought more people on or wrote more material, I was around for the whole Two River run just like I am for all of Joe's shows chatting with him about the changes they were making and what was going on with the show. I definitely wasn't part of it in an official capacity, but I was there. How it happened with producing it: It's been well document and it's unlike anything else [what happened with the show]. The show didn't get a good New York Times review and it closed. It was not possible to get anyone to touch it or do anything with it, but luckily a cast recording happened, thanks to Ghostlight and Two River. The cast recording also existed and was fine, but no one really cared. Then, in 2017, when the internet started taking notice and things started taking off, myself; and Scott (Joe and Joe's agent), and the writers, everyone was like "Let's get someone to produce this. Why can't we get anyone to pay attention? This is so crazy, the online fandom for it." What's interesting is that I have never produced anything at the level that I am producing Be More Chill right now. I knew that when I finally produced a major musical of Joe's in New York, it had to be the right circumstances because at any point I could have gone "Okay, who cares that we got a bad New York Times review and no one care about this show , let's bring Be More Chill now." I knew from knowing history as well as I do that that would have been the wrong decison. That wouldn't have been right for the show or me or Joe or anything, but once this all started happening, and we started looking for someone to produce it, it became very clear that I would do it with them so as soon as we picked Jerry Goehring, who is an amazing producer, to be the one to bring Be More Chill to New York suddenly people were interested in it. I talked to him about doing it together, and the two of us now are producing it together. It's been interesting as far as that goes. It just like for years no one wanted to touch the show then all of the sudden a lot of people did. That's kind of the full story of how I ended up producing it. Then, it's just been that this whole year has been about raising the money, making the decisions, hiring people, making the marketing happen and the casting and everything so it's been quite a Be More Chill journey. What was the process of working with a show that first was at Two River and then went to Off Broadway and now is going to Broadway so soon after? What was it like having a show moving so quickly from Off Broadway to Broadway? JAT: A big part of what was happening with Be More Chil was that no one wanted to do it for this long period of time and then all of the sudden everyone did. It was that momentum that we knew we need to capitalize on.So when Jerry and I came together, we were like "Let's find a theater. Let's do this show." Doing it at the Signature Theatre for 10 weeks, we knew that our investors couldn't recoup their full investment even if we sold out out every ticket at full price. We could not get a theater that had longer then ten weeks to give us but we had to do the show with the idea that if this does well it will hopefully transfer to another Off Broadway theater or a Broadway Theater. We don't know, but the whole idea is that it has to happen now. We can't wait for an open ended theater. We can't wait for a not-for-proft three years from now to try to put us on their season to launch that way to Broadway. It was very clear that what we needed was to bring Be More Chill to Broadway now. With Broadway theater owners, we made that clear as well. Momentum is a huge part of this. We felt like that was key to this show's success.There are so may shows that are trying to get to Broadway. You can have all the money. You can have everything done but you need that theater. That's really what you need.There are shows that want to come to Broadway that have all their money but that might not have taken the Lyceum [Theater]. They might have been like "We need a 1200 seat theater." or somethng like that. That wasn't us. The Lyceum is perfect for us. In a lot of ways, our priority was that moment not being like "Okay, it's been a year, and now Be More Chill is coming back again." Be More Chil was gone, and it came back, and now it's just gotta be back so that was definitely a strategy. Honestly, it could hve turned out any number of ways. If The Play That Goes Wrong hadn't closed, which had nothing to do with us because they closed before we were even looking for a theater or they had announced that they were [closing], we might still be waiting for a theater. A lot it is out of one's hands, but some of it we knew what we wanted and needed the show to do. What advice would you give to someone who wants to do what you do? We thank Jennifer Ashley Tepper for taking the time to speak with us. For more about Feinsteins/54 Below, for a schedule of current upcoming events, and/or to order tickets to an upcoming shows visit https://54below.com. For more about Be More Chill or to order tickets, visit https://bemorechillmusical.com.